In Overton Nevada at the Muddy River Cooper Street Bridge, Maccaferri gabions are being used for a channel bank protection project. The project starts upstream with a Trapezoidal Gabion Mattress channel that runs for 359 feet in length to connect to a concrete channel that transitions from trapezoidal to rectangular, crosses under the new bridge and transitions back to a trapezoidal. Shape with a length of 1484 feet, the concrete channel downstream connects to a trapezoidal Gabion Mattress Channel that runs for 100 feet, then continues with rip rap bank protection for about 1130 feet on the east bank and about 2050 feet on the west bank. The Gabion Mattresses were placed over a layer of type II gravel. of 3 feet tall Gabions were used for the cutoff walls at the beginning and transition of the channel and toe of rip rap bank protection. 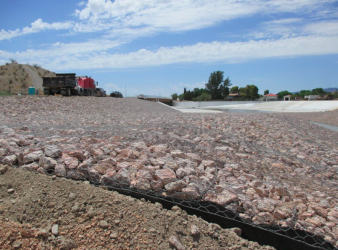 Maccaferri N47.1 Non-Woven Geotextile was installed underneath the Gabions and Gabion Mattresses. The Gabions and Gabion Mattresses are PVC coated and were connected with stainless steel SPENAX rings in order to withstand the aggressive soils on that location. The gabion Mats were not seeded or planted in shoots. Discover more here, Maccaferri will amaze you!